I was delighted to read an advance copy of Randal Eldon Greene’s literary novel, Descriptions of Heaven. Some of you will remember Randal’s, Come Light, from Issue Eight of Unbroken. If you haven’t read him, head over there and read that now, and you’ll get a taste of the author’s voice. 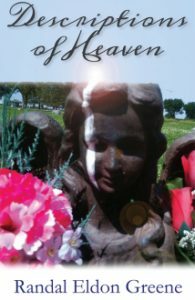 It is that voice and the author’s gorgeous, poetic prose that deliver the emotional and unforgettable narrative in Descriptions of Heaven. Some authors tell great stories with drab prose, and some have striking prose, but no real story. Greene nails both. With so many hauntingly beautiful lines, and characters that I cared about and became attached to, I felt as if I, too, took this journey, and I’ve been changed along with them. And for me, that’s the ultimate gift that a story could give. Descriptions of Heaven will be available November 22, 2016. Mark the date and grab your copy. For more information on the author and his book, check out him out online, and watch for a new piece from Randal in the January 2017 issue (Issue 12) of Unbroken.